Apple Maggot Fly (AMF) -- Rough guess of date first apple maggot flies are caught on traps is: Tuesday, June 28. Rough guess of peak AM trap captures is: August 2, Tuesday. Codling Moth (CM) -- Codling moth development as of July 5: 2nd generation adult emergence at 0% and 1st generation egg hatch at 96%. 2nd generation 7% CM egg hatch: July 24, Sunday, = target date for first spray where multiple sprays needed to control 2nd generation CM. 2nd generation 30% CM egg hatch: August 3, Wednesday, = target date where one spray needed to control 2nd generation CM. 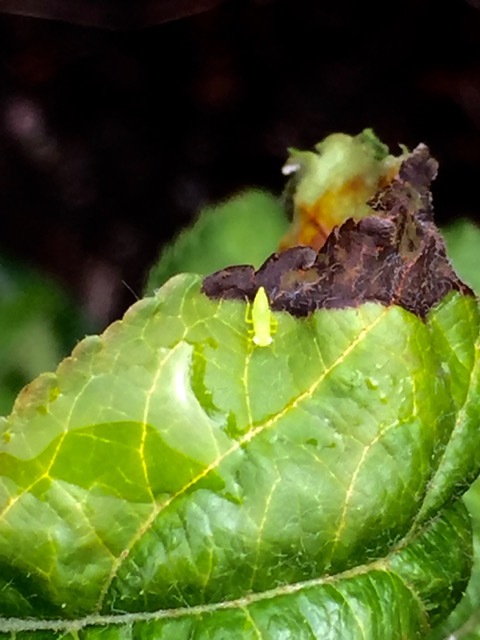 Obliquebanded Leafroller (OBLR) -- Optimum sample date for late instar summer generation OBLR larvae: June 29, Wednesday If first OBLR late instar larvae sample is below threshold, date for confirmation follow-up: July 3, Sunday. Oriental Fruit Moth OFM -- 2nd generation OFM flight begins around: June 25, Saturday. 2nd generation - first treatment date, if needed, July 2, Saturday. 2nd generation - second treatment date, if needed: July 13, Wednesday. Redbanded leafroller (RBLR) -- 2nd RBLR flight begins around June 26, Sunday. Peak catch and approximate start of egg hatch: July 8. Spotted Tentiform Leafminer STLM -- 2nd STLM flight begins around: June 14, Tuesday. 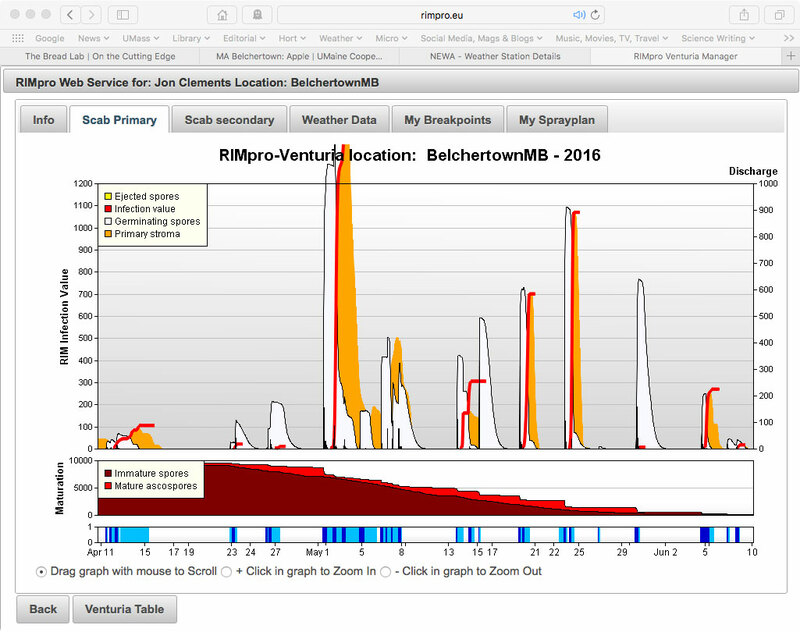 Rough guess of when 2nd generation sap-feeding mines begin showing: July 2, Saturday. Optimum first sample date for 2nd generation STLM feeding mines is July 8, Friday. Really what should be on our minds is how dry it has been and how it might affect the crop. No peaches to worry about, but certainly apples are under some stress and have started to set terminal buds. Apples are pretty resilient, but need some moisture to grow and size fruit. I was beginning to question the need for irrigation as the last several years have seen plenty of moisture, but now many orchards are under a "moderate drought" status. This can't be good. Now I am convinced, that in addition to deer fence, trickle irrigation is a !!must-have!!! in any new orchards going in the ground. 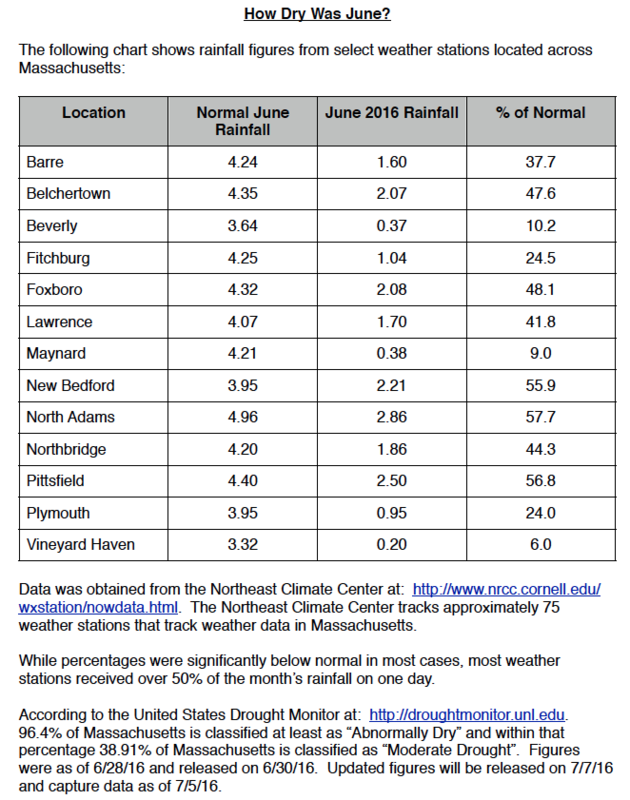 Thanks to Tom Smiarowski, UMass Risk Management/Crop Insurance Education program, for compiling the June precipitation info below. Hope to see you at the MFGA Summer Meeting on July 13 at the UMass Orchard in Belchertown. Please pre-register (by Monday, July 11!) here. • Potato leafhopper (PLH) are here for sure, right on time. 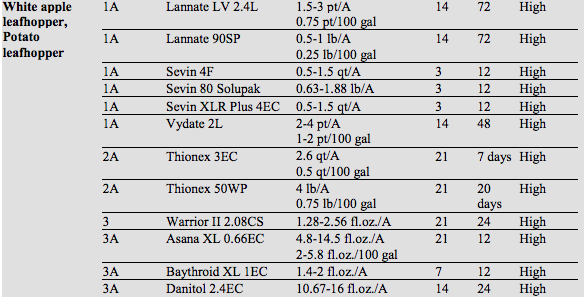 Threshold for tolerance is ZERO in new plantings, consult NETFMG (or below) for treatment options, many insecticides are effective, however, Assail, and imidacloprid would be good "softer" (i.e., beneficial insect-friendly) options. Management for the summer generation is recommended if 1% to 2% of terminals or fruit/blossoms are infested. Resample the orchard in three to five days to ensure the population was not underestimated. 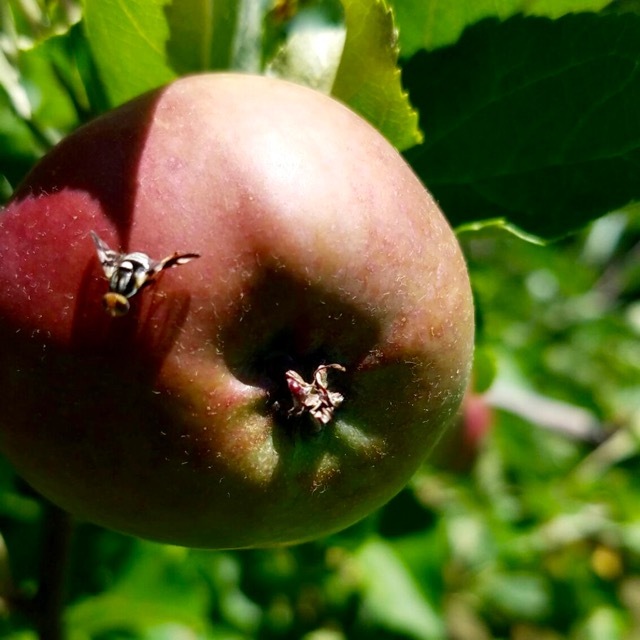 Once the threshold of 1% to 2% of terminals or fruit are infested, an insecticide is recommended. Follow up sprays may be required because of the extended larval emergence of the summer generation (four to five weeks). At this point in the season we are nearing the end of obliquebanded leafroller (OBLR) emergence. The majority of 1st instar nymphs have hatched from egg clusters and are now developing into larger larva. 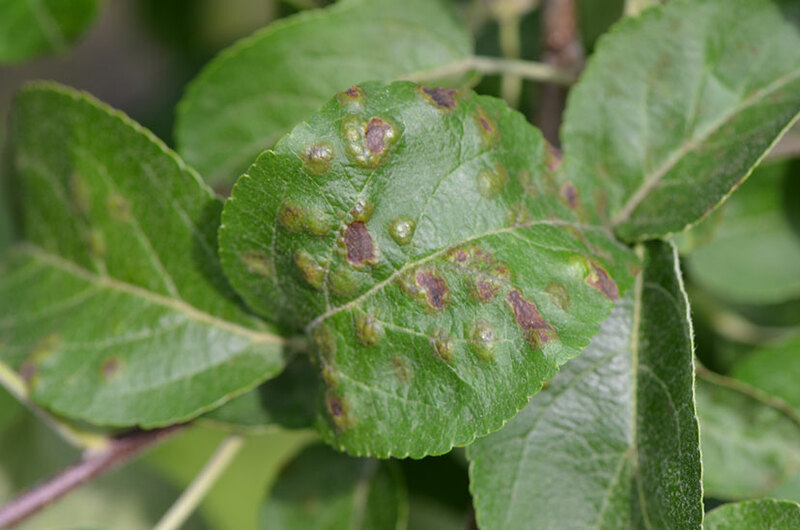 In untreated apple, foliage and fruit feeding will become more evident over the course of the week. 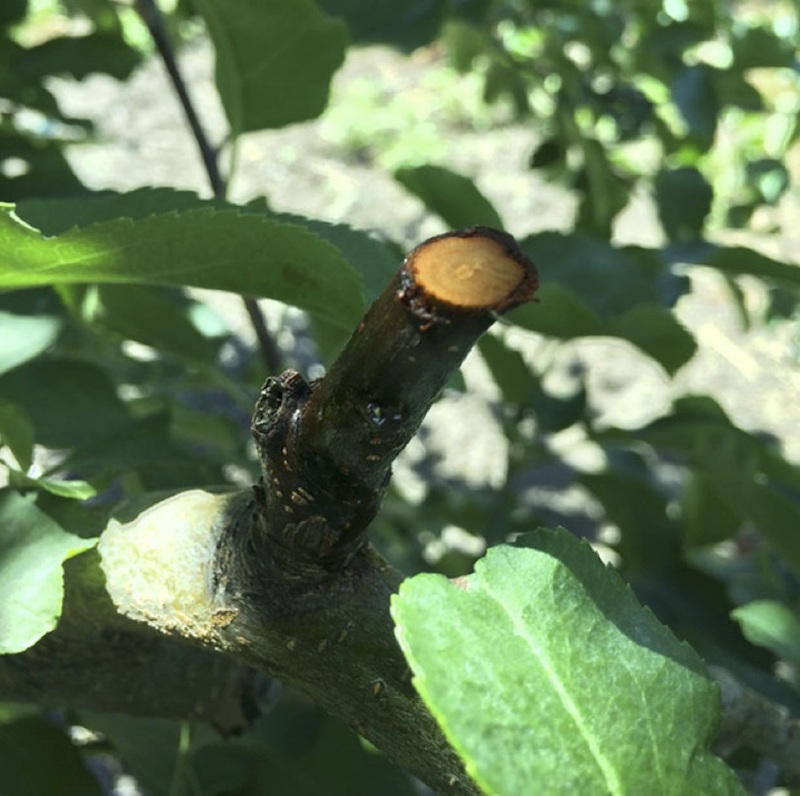 In orchards with historic OBLR damage, growers controlled the larval emergence this season beginning in early to mid-June, making two applications for the summer generation at 14 to 21 day intervals. Approximately 90% OBLR hatch occurred @ 810 DD43 (23rd June) with 1035.7 DD43 accumulations as of July 2nd in Highland, representing nearly 100% hatch. The residual of two applications during hatch using effective insecticides have been shown to reduce the OBLR through emergence. With relatively little in the way of rainfall this season , residual activity should have been excellent. Obliquebanded Leafroller According to our developmental models, the first summer brood hatch should be anywhere from 50–100% complete around the state this week. Orchards with historically high OBLR pressure should normally receive an application of a suitable material during the first part of July, so this week would be the latest possible time for such an application against the larvae of this brood if they haven't been attended to. Delegate, Altacor, Belt, Exirel, Rimon and Proclaim are appropriate choices, particularly in cases where the larvae are a bit larger, and a B.t. product such as Dipel, or else the IGR Intrepid are also options, but these tend to be more effective when applied against the earlier stages. If you are applying any of the diamides (Belt, Altacor, Exirel) or Delegate to control codling moth and oriental fruit moth, they will also be very effective against OBLR at this time. Regardless, we have found that this specific spray is the most critical for preventing fruit-feeding damage at harvest, so put this at the top of your list of priorities if OBLR has distressed you in the past. • Apple maggot fly (AMF) are emerging, although these first flies don't demand treatment. But for the first insecticide spray, where and when necessary, consult the NETFMG for recommendations. Apple maggot fly on apple in central Massachusetts orchard 30-June, 2016. Submitted by to remain anonymous apple grower, thanks. Fungicides needed? At this point in the season it is clear whether or not scab has started in apples. If you’ve looked and aren’t seeing any in the places where it’s most likely, then chances are there is none. While we have plenty of scab visible for a month on trees that were not sprayed in a high inoculum block, where we sprayed scab incidence is very low particularly on the few fruit we have. It was a relatively easy scab year. The one major infection event hit May 1 and went on for several days. There were three other significant scab infections in May, but nothing close to the wet week of May 1.
threshold for a significant infection. 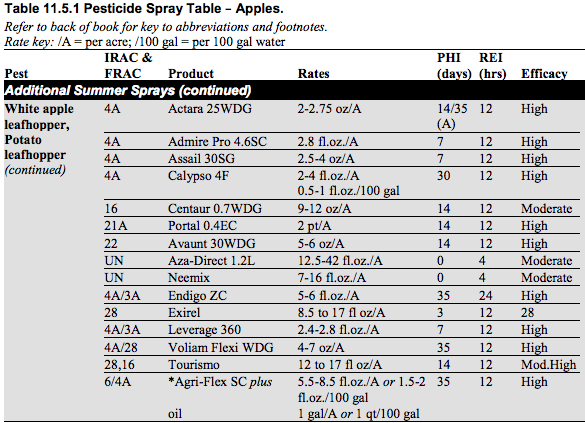 So, if there’s no scab in an orchard, why spray fungicides in the summer? There are other fungal diseases, primarily sooty blotch/flyspeck, powdery mildew, and fruit rots. But this lawn-burning drought weather is unlikely to put much pressure on for these diseases, with the possible exception of mildew. 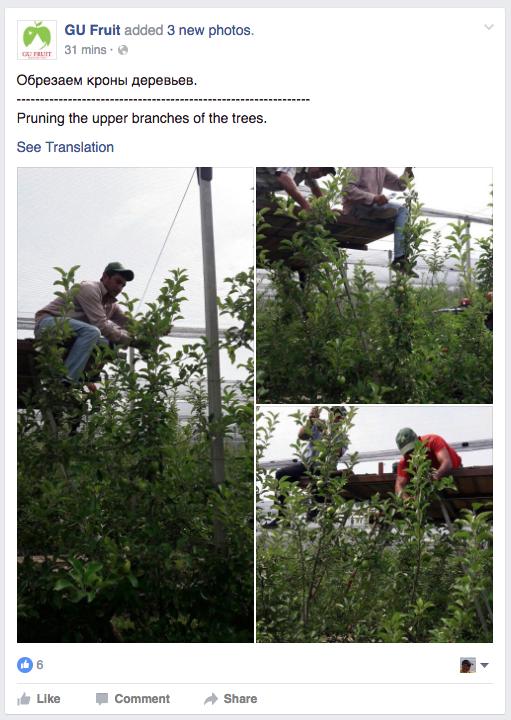 For those of you thinking it might be nice to grow apples in Yakima, Yakima has come to you. There simply hasn’t been enough wet or even humid weather to push SBFS along. While we might get some wet weather towards the weekend, it would be a good thing. It still won’t make it important enough to apply a fungicide for SBFS. While we know less about the amount of rain needed to cause infections, black rot, bitter rot and white rot probably haven’t had a chance to get started either. If you think maybe mildew is a problem to be sprayed, check your most susceptible trees: Cortland, Ginger Gold, Idared, Paulared and Rome are relatively more susceptible varieties. Unless you see a problem, it’s probably not worth a spray. Which means, I think, that you can take advantage of the Yakima-like climate and forget about fungicides for at least a couple of weeks. Shoot (fire) blight. Some growers have been pruning out shoot blight. These infections probably got started back in late May. At this point, the only thing to do is prune out the infections as they appear. Do not apply streptomycin! If you really want to spray, then you could try Cueva or Mastercop plus Double Nickel. This may russet fruit, but has shown promise in stopping shoot blight infections. Do prune out the blight as soon as you see it. When pruning fire blight, the best method to use is the “ugly stub” approach. Make cuts into wood that is at least two years old. Two-year-old wood is more resistant to fire blight than one-year wood, and can slow or stop infection movement in the tree. 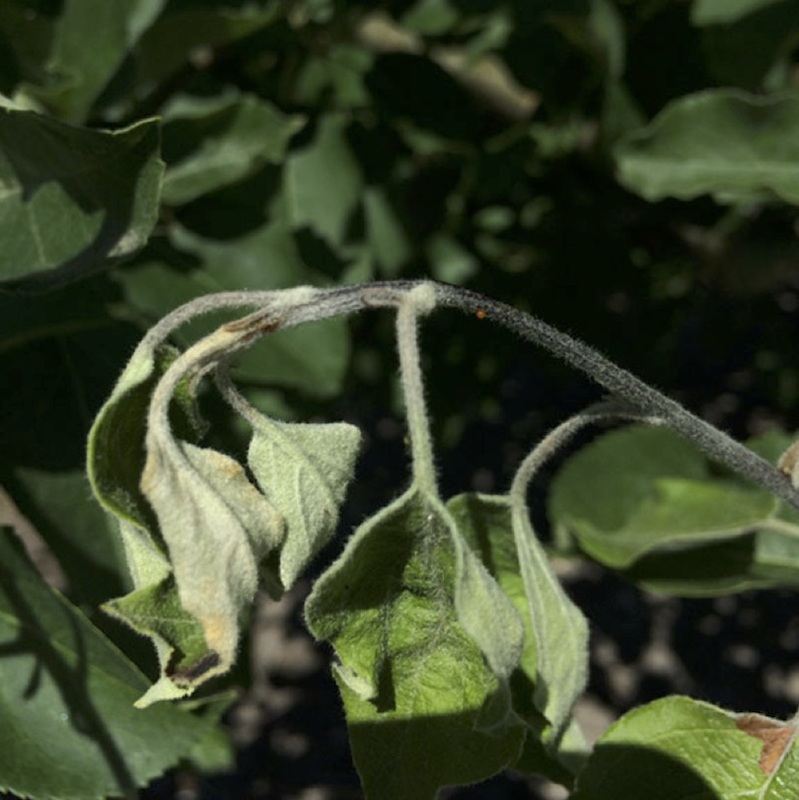 Fire blight bacteria travel well ahead of visible infection, so cut at least 18 inches below visible infections. Cutting back to a 4 to 6 inch naked stub in two-year-old or older wood allows the tree to use its own resistance to isolate disease in the stub. Inevitably the fire blight bacteria will form a canker an inch or two in from a cut surface. Sterilizing tools will not stop this, so it is not worth the effort. As a result, if a flush cut is made back to the branch collar, the resulting bacteria colonization and canker will form an inch or two into the next limb or in the trunk. By leaving a stub, the canker forms in it, and the stub can be cut off with the canker during the next winter. infection before it reaches the next branch. • No YouTube video this week. The next Healthy Fruit will be published on Tuesday, July 12 (or thereabouts), 2016. As always feel free to get in touch with any member of the UMass Fruit Team (http://extension.umass.edu/fruitadvisor/team-members) if you have questions or comments.